In December 2009, Travel & Leisure Magazine voted Taos New Mexico the #1 place to spend your Christmas Holiday (Click here to read full article.) Christmas eve @ Taos Pueblo either Desert Oak or Compound at Stargazer will provide the perfect base camp for families and friends to gain a sense of inspiration and adventure that deepens relationships to the landscape and the art of Northern New Mexico and, most importantly, to each other. Just a short drive to Taos Ski Valley, the magical town of Taos sits nestled where the foothills of the Sangre de Cristo Mountains meet the high desert. You’ll find rugged peaks and lush pastures — breathtaking sunsets, enchanting vistas, big blue sunny days and star-filled skies at night. Taos boasts numerous art galleries and quaint shops featuring Native American, Hispanic, and contemporary arts, crafts, antiques and numerous museums. There is also the historic Town Plaza, with renowned restaurants with an array of cuisines. There is Orlando’s for traditional New Mexican, Pisano’s for pizza and Sushi a la Hattori for traditonal Japanese. At the south end of town is the Sagebrush for Two-Stepping to local bands and The Taos Country Club and Golf Course. Taos offers a relaxed, year-round lifestyle where you can enjoy a vast array of cultural activities; including Native American ceremonies in the 800 year-old Taos Pueblo, Spring and Fall Arts Festivals, as well as writer’s and artist’s workshops. Taos is also a conscious community priding itself as a steward of the environment, with alternative technologies and many volunteer programs. The famous San Francisco de Asis Church, painted by Georgia O’Keefe and photographed by Alfred Steiglitz, is the gateway from the south, in Ranchos de Taos. From Desert Oak or Compound at Stargazer you can venture on excursions into the surrounding National Forest for camping, fly fishing, hiking, horseback riding, cross-country skiing, llama trekking, snow shoeing and mountain climbing. The more adventurous will discover thrilling white-water rafting down the Rio Grande and ambitious hiking up 13,616 feet to Wheeler Peak. Santa Fe is just over an hour away, giving you access to world-famous cultural attractions, including The Lensic Performing Arts Center and The Santa Fe Opera. 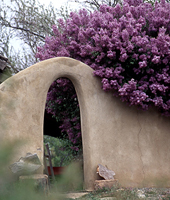 A shorter scenic drive will take you to Georgia O’Keefe’s home in Abiquiu.